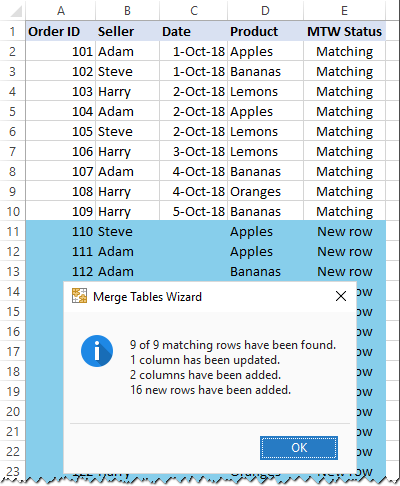 In this tutorial, we will look at how you can join tables in Excel based on one or more common columns by using Power Query and Merge Tables Wizard. Combining data from multiple tables is one of the most daunting tasks in Excel. If you decide to do it manually, you may spend hours only to find out that you've messed up important information. If you are an experienced Excel pro, then you can possibly rely on VLOOKUP and INDEX MATCH formulas. A macro, you believe, could do the job in no time, if only you knew how. 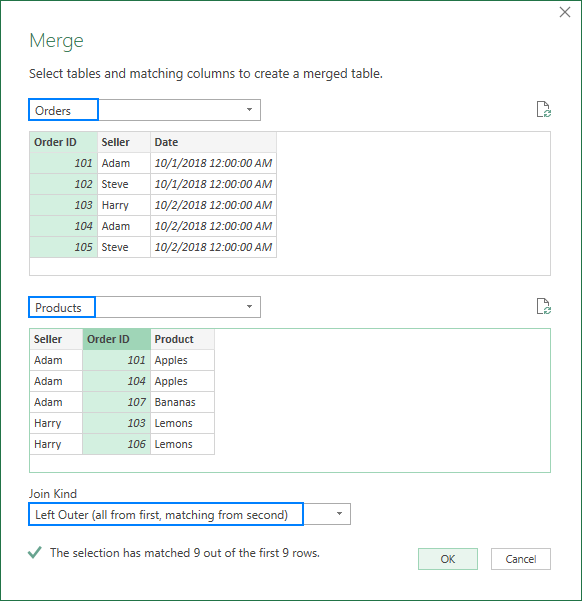 The good news for all Excel users - Power Query or Merge Tables Wizard can be your time-saver. The choice is yours. 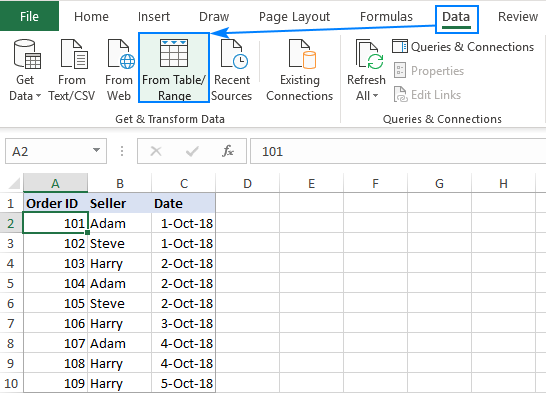 In simple terms, Power Query (also known as Get & Transform in Excel 2016 and Excel 2019) is a tool to combine, clean and transform data from multiple sources into the format you need such as a table, pivot table or pivot chart. 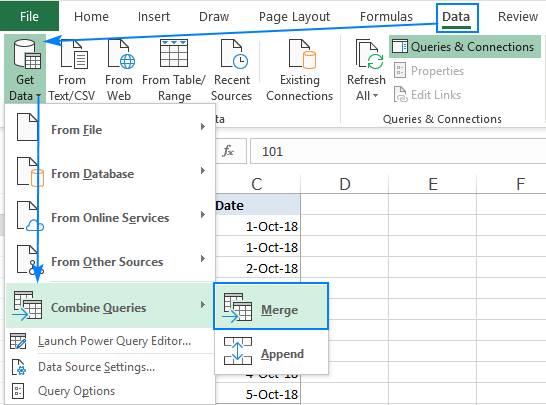 Among other things, Power Query can join 2 tables into 1 or combine data from multiple tables by matching data in columns, which is the focus of this tutorial. For the tables to be combined correctly, they should have at least one common column (also referred to as a common id or key column or unique identifier). Also, the common columns should contain only unique values, with no repeats. The source tables can be located on the same sheet or in different worksheets. Unlike formulas, Power Query does not pull data from one table to another. It creates a new table that combines data from the original tables. The resulting table does not update automatically. You should explicitly tell Excel to do this. Please see how to refresh a merged table. 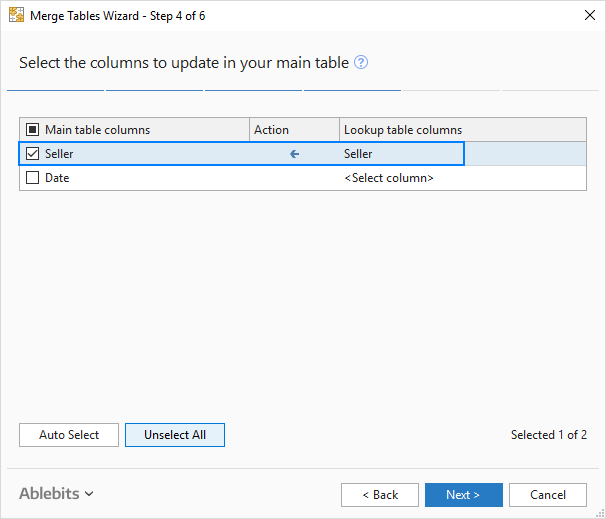 As an example, let's join 3 tables based on the common columns Order ID and Seller. Please note that our tables have different numbers of rows, and although table 1 has duplicates in the Seller column, table 3 contains only unique entries. 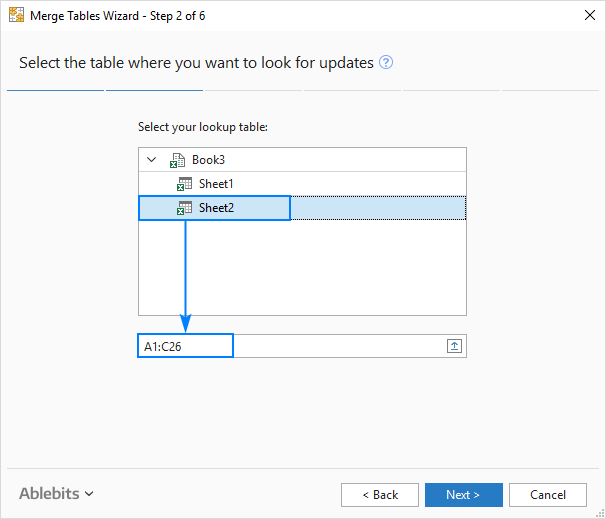 Not to clutter your workbook with copies of your original tables, we are going to convert them into connections, do the merge within the Power Query Editor, and then load only the resulting table. Select your first table (Orders) or any cell in that table. Go to the Data tab > Get & Transform group and click From Table/Range. In the Power Query Editor that opens, click on the Close & Load drop-down arrow (not the button itself!) and select the Close and Load To… option. 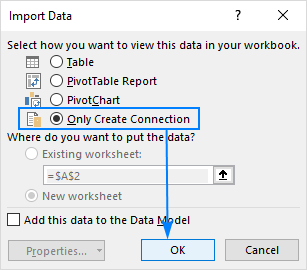 In the Import Data dialog box, select the Only Create Connection option and click OK. 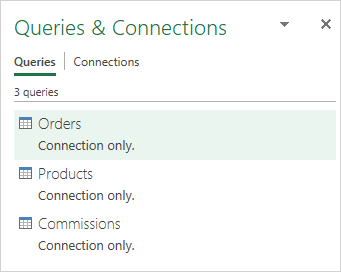 This will create a connection with the name of your table/range and display that connection in the Queries & Connections pane that appears on the right-hand side of your workbook. 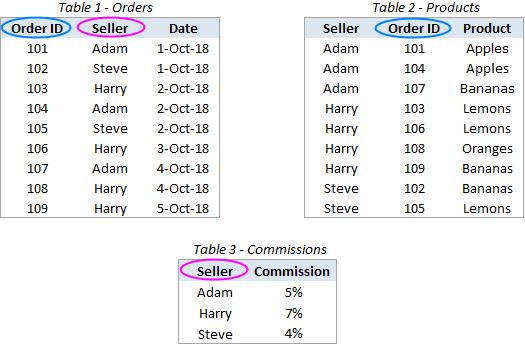 Repeat the above steps for all other tables you want to merge (two more tables, Products and Commissions, in our case). Select your 1st table (Orders) from the first drop-down. Select your 2nd table (Products) from the second drop-down. In both previews, click on the matching column (Order ID) to select it. The selected column will get highlighted in green. In the Join Kind drop-down list, leave the default option: Left Outer (all from first, matching from second). Upon completion of the above steps, the Power Query Editor will show your first table (Orders) with one additional column named like your second table (Products) added to the end. This additional column does not have any values yet, just the word "Table" in all the cells. But don't feel discouraged, you did everything right, and we are going to fix that in a moment! In the added column (Products), click on the two-sided arrow in the header. Keep the Expand radio button selected. 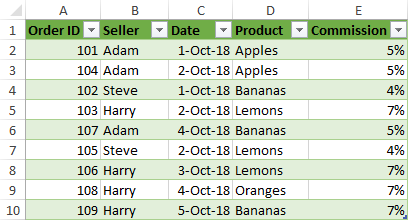 Unselect all columns, and then select only the column(s) you want to copy from the second table. In this example, we select only the Product column because our first table already has Seller and Order ID. 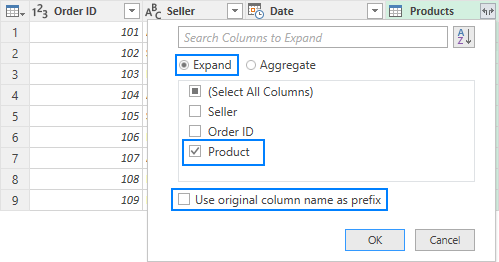 Uncheck the Use original column name as prefix box (unless you want the column name to be prefixed with the table name from which this column is taken). 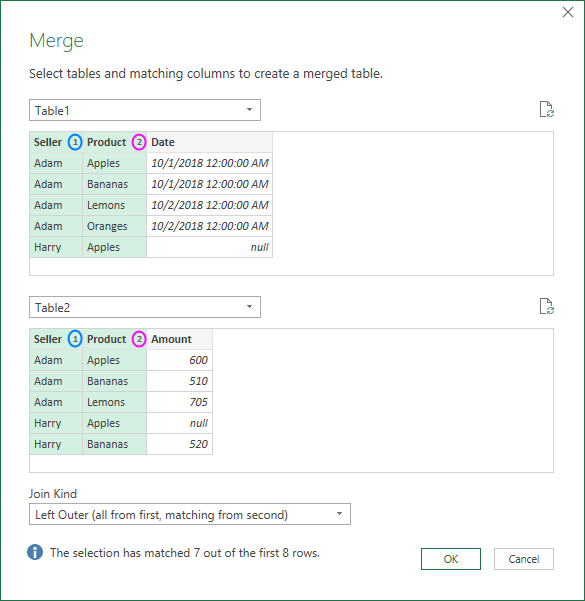 If you need to merge only two tables, you may consider the work almost done and go load the resulting table in Excel. In the Power Query Editor, click Close & Load drop-down arrow and select Close and Load To…. In the Import Data dialog box, select Only Create Connection, and click OK. 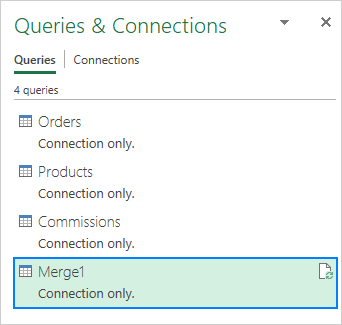 This will add one more connection, named Merge1, to the Queries & Connections pane. You can rename this connection if you want (right-click and select Rename in the pop-up menu). 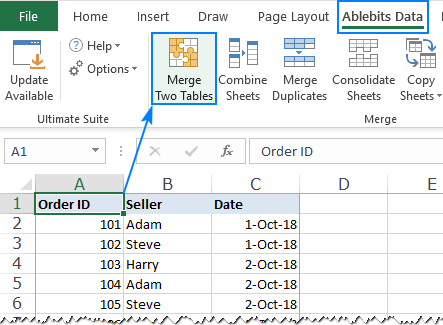 Combine Merge1 with your third table (Commissions) by performing these steps (Data tab > Get Data > Combine Queries > Merge). 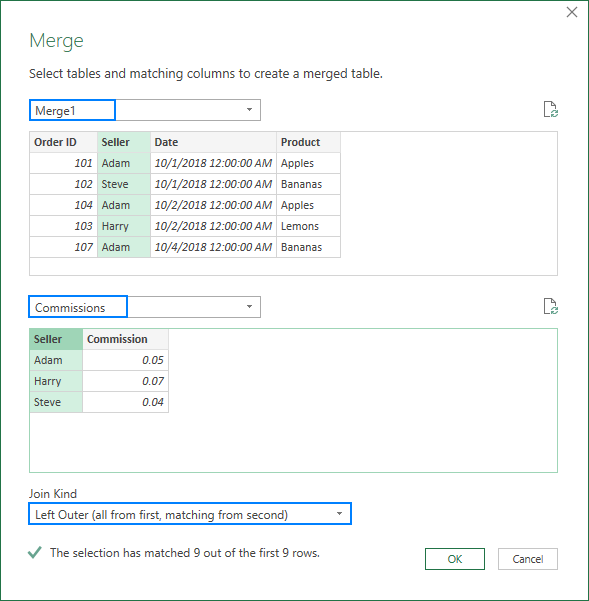 Clicking OK in the Merge dialog box opens the Power Query Editor, where you select the columns to be added from table 3. As the result, you get a merged table that consists of the first table, plus the additional columns copied from the other two tables. 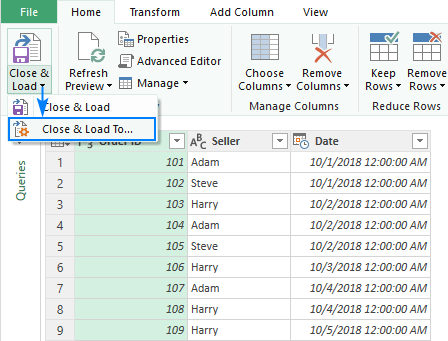 With the resulting table in the Power Query Editor, there is just one thing left for you to do - load it in your Excel workbook. And it is the easiest part! In the Power Query Editor, click the Close & Load drop-down arrow, and choose Close and Load To…. 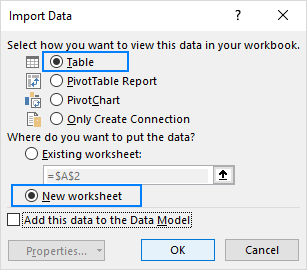 In the Import Data dialog box, select Table and New Worksheet options. A new table combining the data from two or more sources appears in a new worksheet. Congratulations, you did it! Tip. If your tables contain numeric data (e.g. sales numbers or quantity) and you want a quick summary, you can load the resulting table as a PivotTable Report or create a pivot table in the usual way (Insert > PivotTable). After that, perform exactly the same steps as described above, and your tables will be merged by matching values in all the key columns. 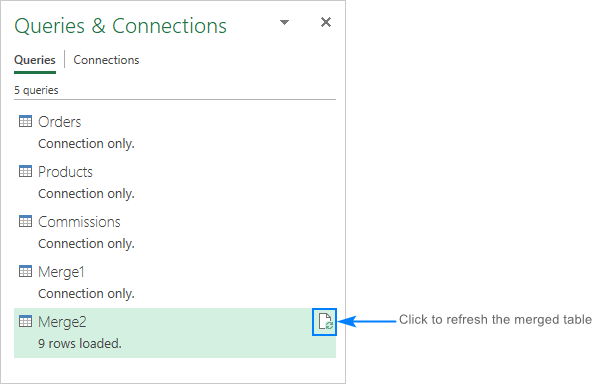 If the pane has disappeared from your Excel, click the Queries & Connections button on the Data tab to get it back. Now that you are familiar with the inbuilt tool, let me show you our approach to merging tables in Excel. Take a quick look at the selected range to make sure the add-in got it right and click Next. Please notice the Case-sensitive matching box at the top. Select it if you want to treat uppercase and lowercase text in the key columns as different characters. For this example, we don't need that, so we leave the box unselected. Select the columns to update in the first table. This step is optional, and if you don't want any updates, you can click Next without selecting anything here. This step is very important because it determines how your tables will be merged. Make your choices, click Finish, allow the wizard a few seconds for processing, and examine the results. 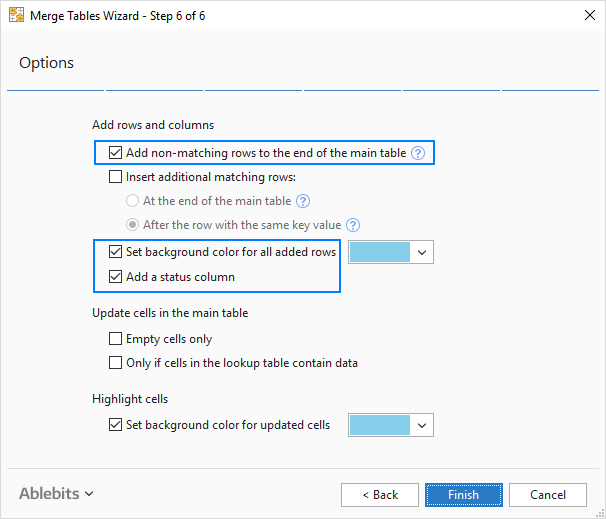 With the default options, the wizard highlights the newly added rows and adds the Status column. If you don't want any of that, clear the corresponding boxes in the last step. To join three and more tables, simply repeat the above steps. Just remember to select the result of a previous merge as your main table. 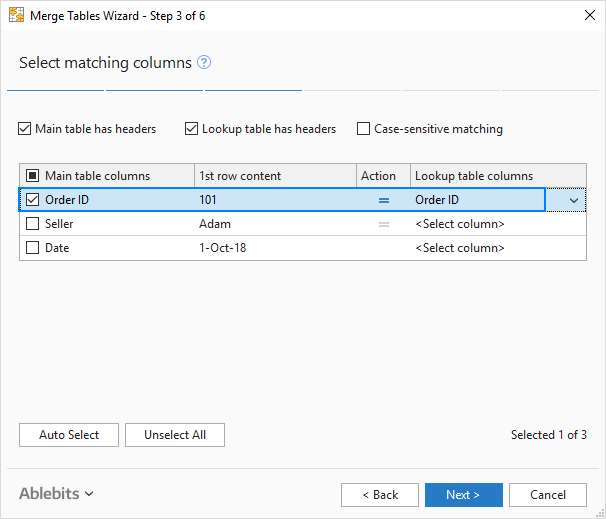 Unlike Power Query, the Merge Tables Wizard does not keep a connection between the resulting and source tables. In some situations, this may be a disadvantage. On the plus side, no matter what you do with the source table - edit, move or even delete - the merged table remains intact. This example has shown just one scenario that our wizard can handle, but there is much more to it! If you are curious to know other use cases, please check out these examples. 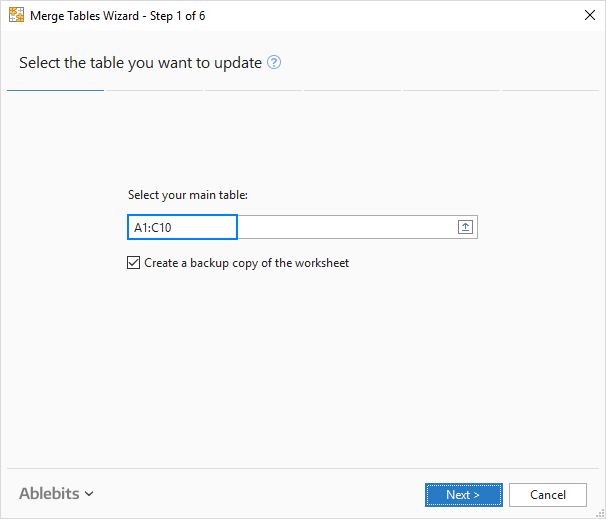 Or you can download a 7-day trial version of the Merge Tables Wizard and see for yourself. If you like the add-in and decide to get a license, we will gladly offer you the 15% off coupon code that we've created especially for our blog readers: AB14-BlogSpo. In case you are looking to join tables in some other way, you may find the following resources useful. 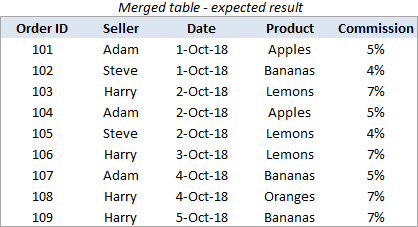 Merge tables by column headers - join two or more tables based on column names. You can choose to combine all the columns or only the ones you select. Combine multiple worksheets into one - copy multiple sheets into one summary worksheet. Of course, it's not manual copy/pasting! You only indicate which worksheets to merge, and our Copy Sheets tool does the rest. Compare two Excel files - how to compare two tables (worksheets) for differences and merge them into a single sheet. One Response to "How to join tables in Excel: Power Query vs. Merge Tables Wizard"
Then when I use "myfunction", I generate one table whit two additional colums, one with the label and other with account type for every cuenta in the table datos. "ID" is unique over the table "cuentas", and cuentas have many entries in the transactional table (datos) in the field "cuenta".